For some people, checking something in the car is quite difficult even taking a long time like a tire. Therefore, not a few of them are lazy to replace that part. But actually check the tires are still worth using or not quite easy. Trainer Rifat Drive Labs, Herry Wahyudi revealed that to check the feasibility of tires is not difficult and complicated. It's just that some people are lazy to do so in the end they choose to outsmart a tire that is not good as given pattern. "Tire manufacturers are always demanding their products with international standards, and now they have provided tools to help us check their own tires, T.W.I (Tread Wear Indicator) or tire wear indicators," he said in Jakarta. "But yes sometimes our people when talking the tire if it has not seen the thread has not been considered exhausted 'well, not bald', would have been talking, or if its pattern no longer exist, no flower or plot he instead make the plot again. Well, this is wrong, dangerous loh, "Herry continued. Himself share tips to see the feasibility of tires with ease that is by looking at the bulge around the tire. The triangle is four to six in each wheel that is about 1.6 to 1.8 tread. "How do we know the tire is still feasible or not? We can check on the tire wall there is usually a triangle shape Or in some parts there is a TWI or logo from the manufacturer of the tire itself.On the left and right will be the same location. pull a straight line between the flowers (pattern on the tire), then there will be a bulge, "Herry explained. Well, if the tire is worn then the tread on the tire will reach the indicator (T.W.I) or easy language, when the bump is already the same as the tire surface. 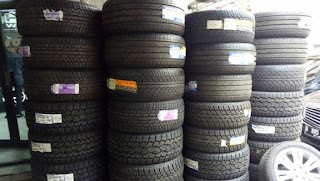 "If we have used the tires often, try to check this lump has cut off the groove or the lump is the same surface with the tire or not.If it is, then it should be replaced.Don't wait bald, plasticity yarn, or even to explode, "Herry said. He also added that it applies when drivers want to buy used tires. When the logo T.W.I or the triangle is not there, can be ascertained that the tire was give pattern (made pattern or new groove). So, the tires will not last long or not good anymore. 0 Response to "Do not Wait Bald, This How To Check Tire Still Worth Use Or Not"